Where do I start with this one? Meek Mill is one of the biggest street emcees of this new generation without a doubt, BUT the young rapper has a lot to learn in this rap game. This album portrays a young rapper who HAD a lot to say but lost his hunger along the way. The lack of originality this album displays bothers me; Meek Mill is very repetitive, he shows no improvement what so ever from his previous projects. One things I did like about this LP were the great beats produced by some of the young beatmakers of this time such as: Boi-1da, Cardiak, Key Wane, and Jahlil Beats. Meek Mill’s beat selection is great when it came to this album. One of my favorite tracks, well my ONLY favorite track on this album is Maybach Curtains produced by DJ Infamous and features the MMG General Rick Ross, G.O.O.D. Music’s soul man and the ever most talented John Legend and New York’s greatest Nasir Jones. This track displays how young Meek Mill came from nothing to something and uses legendary rap quotes from Biggie Smalls; “And birthdays was the worst days, Last week I made a hundred on a Thursday “. Other than that Meek Mill’s debut doesn’t display anymore or any-less than what his talent has to offer which really disappoints me as a fan t this rap culture, maybe in the future he can prove me wrong by NOT having the worst flow in MMG, this album should have came with Advil, and Tylenol, please BELIEVE IT, no track 5 though. Dreams & Nightmares? 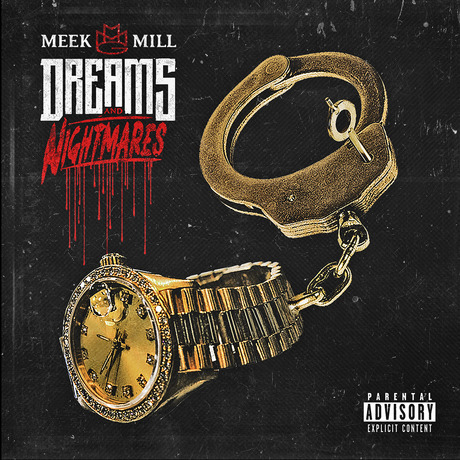 More like Screams & Nightnares, but at least Meek Mill is out of prison and getting money. Amen!